Pigeon fanciers like to place their own pigeon breed in a positive light. Imagination often dominates facts. So with success the London pharmacists John Moore 1735, author of the first monograph on pigeons and with great influence on all subsequent authors. For Moore his Carrier was the 'king of the pigeons'. This view was apparently shared by distinguished personalities of his time. He named Richard Atherton, whose family and landowning in Lancashire is traced back to the time of Henry I (1100-1135). Atherton had planned to build pigeon lofts on his estate for the different breeds know at that time, a plan that could not be realized by his early death in 1726 (p. viii). As one of the admirers of the breed he calls the distiller Mr. Hickmann, who always had a silver hatchet and a block with him, with which he decently chop'd off their heads. Being of the blood royal, they ought not to die after the same manner as the vulgar herd (p. 26). The carrier as a messenger of the Turkish Empire, however, was already known before Moore. Willughby (1678) had described it, even from his own inspection. He would have the size of an ordinary pigeon, the beak would not be short, but of moderate length, typical were the wattled eye ceres and wattled beak. In this appearance, they are depicted as drawings by Frisch (1763) and Neumeister (1837). With this pigeon, the Carrier of Moore, who had become a pigeon raised for beauty, had little in common. Moore did not use figures, but a carrier soon after was portrayed in the Treatise in 1765 by an anonymous author. 'King of the Pigeons': his carrier has not become king by descent, but rather by a coup. Probably due to crosses with French Bagadettes (Brent about 1860) the phenotype has changed drastically. This artifact was enthroned by Moore as the new 'carrier', but it still claimed the legend as a Turkish messenger. Identity theft that would be called today. 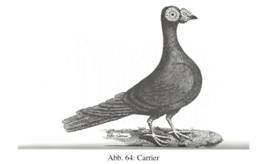 The carrier at Willughby' time had the size of the common pigeon. Moore some decades later proudly indicates the length 15 inches from the tip of the beak to the tail end (p. 25). At a today's Racing Homer it is only about 13 inches. The length of the beak had already moved very far from the 'moderate' length (at a color pigeon e.g. 22-24 mm) reported by Willughby with 1.5 inches or 38.1 mm (p. 26). These changes cannot be explained by selection from the original breed. Dragoon and Horseman were not mentioned by Willughby as breeds, because they probably were identical with his carrier, Moore disparaged them as crossbreeds. He had to so because otherwise he would have had problems to explain the existence of his English Carrier and the ascribed legend. Well-known ornithologists like Tegetmeier (1868) tried to put things right, but to no avail: "The application of the name Carrier to them is to be regretted, as you cannot visit a show without hearing some one who is deceived by the name, speaking of them as the true working homer" (p. 44). Also Fulton (1876) and others turned in vain against the fallacy. Fulton, R., The Illustrated Book of Pigeons. London, Paris, New York and Melbourne 1876. Moore, J., Pigeon-House. 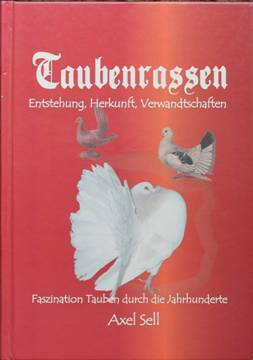 Being an Introduction to Natural History of Tame Pigeons. Colum­barium: or the pigeon house, Printed for J. Wilford, London 1735. o.V., A Treatise on Domestic Pigeons, London MDCCLXV (1765), Reprint Chicheley, Bucking­hamshire 1972. Sell, Axel, Brieftauben und ihre Verwandten, Achim 2014. Sell, Axel, Pigeon Genetics. 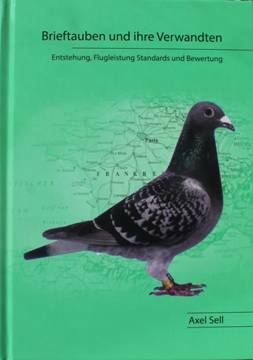 Applied Genetics in the Dometic Pigeon, Achim 2012. Sell, Axel, Taubenrassen. Entstehung, Herkunft, Verwandtschaften. Faszination Tauben durch die Jahrhunderte, Achim 2009. Tegetmeier, W.B., Pigeons: their structure, varieties, habits and management, London 1868. Willughby, Francis, The Ornithology in Three Books. Translated into English, and enlarged with many Additions throughout the whole work by John Ray, Fellow of the Royal Society, London 1678.